Hey! I write LGBTQIA+, usually with a twist. My solo works are mostly fantasy, sci-fi, supernatural, or similar. Currently working on Wildwood Rising, a long LGBTQIA+ fantasy series; first book written/being edited: Incarnations. By the way, you may know me because I co-wrote In the Company of Shadows. To ask Ais questions, please sign up. BRAVO!! I just finished ICOS and I am still basking in the afterglow of your literary mastery! I have a question-has it ever been mentioned of the idea of Hsin and Boyd going back to the Agency so that Boyd could get a "Mod" of an advanced bionic eye so that he could once again be Hsin's partner in the Janus Unit? Hi Ais ! I read ICOS back in 2013 and to this day it's still the best I've read. Thank you ( and Sonny of course) for making this happen! knowing that ICOS exists makes my life beautiful. My question for you is: Which characters of ICOS did you write? I mean I've read Santino's recent works and I can confidently say that I recognized Boyd(<3) and Emilio(<3) and maybe even Hsin (<3). Description: I found this story on my hard drive and have no idea what inspired me, but perhaps it was Olympus by Aki. I think I wrote this 6/17/2013. Description: A series set in the past from In the Company of Shadows. Julian 'JJ' Jones was a private investigator and a good friend of Cedrick Beaulieu. He had his finger on the pulse in Lexington, PA, but didn't realize just how involved he would become. This series is set in the past and features cameos from Cedrick, Vivienne, and even little 5-year-old Boyd Beaulieu, along with other ICoS characters. IMPORTANT: Contains spoilers for ICoS, do not read until you've finished Fade! Description: These are a series of short, unconnected oneshots, drabbles, and possibly assorted unfinished shorts from writing group. I'm sharing them mostly so they don't die a sad, lonely death on my hard drive, and secondarily so there is more reading material on the internet for the terminally bored. Description: These are a series of unconnected works in progress I started and might continue in the future. Shared here for similar reasons as the writing group shorts, and in case anyone wants more of something they see.
" lol yeah I heard about the cocky thing... never a dull moment, apparently. I told my friend about it since she's getting into the het romance field. Ye lol yeah I heard about the cocky thing... never a dull moment, apparently. I told my friend about it since she's getting into the het romance field. If anyone still needs that post, it's on my blog (https://aisness.wordpress.com/2018/03...) but you really don't have to read it at this point unless you really want to. I don't care if anyone reads it, I just, idk, don't know how else to protect ICoS readers other than to give that warning? Now I just made it sound super ominous when I didn't mean to. See, this is why I didn't post here before, because I have no idea how to properly address the topic here where it matters most. I get stuck between my typical reaction of downplaying things to make others feel better, and then worrying if I downplay too much I'm not being fair to everyone involved. And I want to always be as honest as I can be, at which point I start wondering, what level of downplaying or not downplaying is the most honest of all? Then I get stuck in an internal back and forth and probably just make everything fucked up in the end despite having the best intentions. Also in short: this probably makes it obvious why I wrote Boyd XD Dude could tie himself in mental knots as well as I can. Hopefully if you were just worried if I was okay, it will be enough to know I am :) I've been answering some ICoS questions over on tumblr too recently. But if you have still been wondering or worrying during this time and if you had still really wanted to have more context, my post is online still so it's something you can read if you want. Just, seriously listen to me beforehand when I say I loved and still love and will continue to always love ICoS and all the readers and the community and everything. Nothing ever changed that or ever will, regardless of anything else happening. I love the debates and varied viewpoints everyone has had over the years. I think it's awesome because it shows complexity in the readers in the same way there was complexity in the characters, and since humans are complex in general, idk that just makes me really happy. Anyway that's enough on that, I'm probably now just drawing way too much attention to my idiocy at this point. Thanks for being awesome! And sorry I wasn't on facebook much then (or even now). I hope you have a lovely day! <3 ...more "
We’d love your help. Let us know what’s wrong with this preview of The Infinite Book by John D. Barrow.
" Hi Rath! You aren't bad at this at all :) We never really explained it well lol The backstories are basically like side stories that are background st Hi Rath! You aren't bad at this at all :) We never really explained it well lol The backstories are basically like side stories that are background stories for the characters. In this case, the back stories are, I think, all focused on Emilio and/or Carhart. I don't recall for sure. But that was something Santino wrote back before he had decided he was going to do a whole book (or series?) called 180 Proof Vega which would follow Emilio when he was younger. ...more "
“If there was a hell beyond what he knew, he would welcome it. He had no reason not to. “Standing back and staring blankly at the glass, he realized he had no idea what it meant to preheat. Obviously he heated it prior to something, but to what? Ais wrote: "Fenriz wrote: "I'm flattered to receive your request and I'm very much glad to accept it. It's really nice to find others Aces around. :)!" Ohh is that a term for us? I love it! I want to call mys..."
Haha yeah that's our term! It's so rad right? I think i found the term for the first time on Tumblr. It reminds me of the Ace fighter pilots and since I love aircrafts, i like it more. Fenriz wrote: "I'm flattered to receive your request and I'm very much glad to accept it. It's really nice to find others Aces around. :)!" I'm flattered to receive your request and I'm very much glad to accept it. It's really nice to find others Aces around. :)! >.< you´re so nice!....i´m really enjoying your work :)"
Ais wrote: "Bucletina wrote: "Thanks for accepting :)"
Thank you for your interest! <3"
Bucletina wrote: "Thanks for accepting :)"
Hayatunnufus wrote: "Thanks for the approve! And umm, if you have any questions related to Indonesia for your stories, I'm available here :)"
Thank you! I'm sure I will when I write that story :) I want it to be as realistic as I can make it. What the ... Why wasn't I your fan? It should have happened ages ago. I just rectified it. Ornella wrote: "Hey Ais! Thanks for accepting my request! :)"
lee wrote: "Hello Ais. So Sonny mention at some point you may write an f/f story. I for one would love to read it. I was telling him a couple of my GR friends and I are on the look out for a good f/f story and..."
Lee! I'm so sorry! Somehow I didn't see this until now. I AM thinking of writing a f/f story... I haven't figured out exactly what I want to write yet. I have a few ideas I've been kicking around. I guess it will amount to whatever ends up sounding most interesting to me. 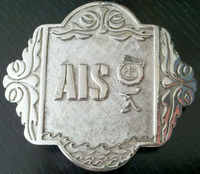 Janice wrote: "Thank you for accepting Ais. And thank you for Boyd & Hsin." Clarissa wrote: "Yay! Thanks for accepting Ais!" Yay! Thanks for accepting Ais! Thank you for accepting Ais. And thank you for Boyd & Hsin. Aure `Reading With The Dark` wrote: "Thank you for accepting me! Another huge, growing bigger as I type, fan over here! :)))"
Marwa wrote: "Hi Ais, thanks for accepting my friend request. I love your writing, I'm still reading book 1 of Company of Shadows but I already love the series :)"
Hi Ais, thanks for accepting my friend request. Julio wrote: "Thanks, Ais. Nice to meet you." Thanks, Ais. Nice to meet you. Just wanna know when will Fade be updated again. Wanna know what will happen next. This series is so amazing. Can't wait." Hi! Thank you for being awesome and reading our story! I'm not sure when it will next update yet -- what we've been doing is writing the chapters and editing them between updates so a lot of it depends on how often our schedules intersect and how fast we can write :) But we're trying to make it so there aren't super long waits in between updates. You should probably expect a couple of weeks at least though, to be honest, based on how things have been going lately. Just wanna know when will Fade be updated again. Wanna know what will happen next. This series is so amazing. Can't wait. ..........although I dunno. Surrounding myself with TW fans doesn't sound like great survival strategy. Any chance you could shake off the Sterek disease? LOL." lol I'm a failure to the cause. I just finished the first season of TW and am starting to see the ways of Sterek. But I can still remain on your side because I resisted TW so strongly for so long! Marleen wrote: "FYI: The meeting with Ann in Chap 30 is in there twice. You may want to fix that." FYI: The meeting with Ann in Chap 30 is in there twice. You may want to fix that. Sonny wrote: "You could at least add some books, scrub"
What books would I even add? Hi, I've been reading all for comments in the group. I really enjoy your characters.